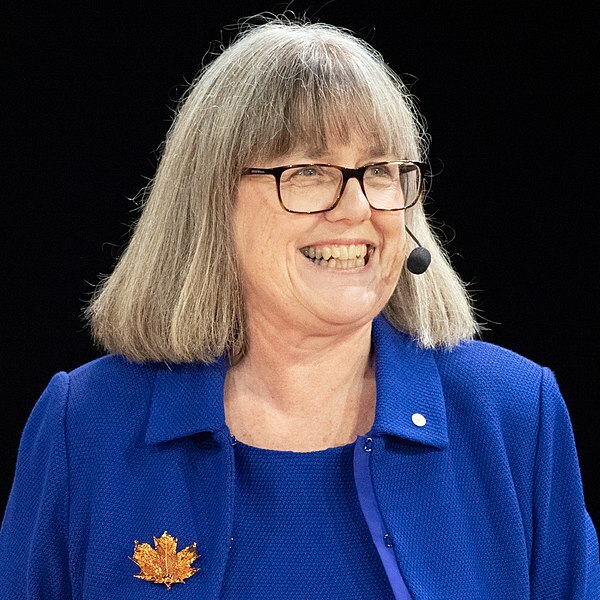 Donna Strickland in Sweden 2018. Image: File:Donna Strickland EM1B5760 (46183560632) (cropped).jpg, Bengt Nyman, CC BY 2.0, via Wikimedia Commons. Donna Strickland was awarded a Nobel Prize this week for her work on chirped pulse amplification, the first woman to to win the award in Physics in 55 years. The announcement of a new Nobel Laureate usually drives readers to their biography on Wikipedia, but the first people who came looking for an article on Strickland were disappointed – there was no Wikipedia article about her. While the Wikipedia community was able to quickly craft an article, the lack of a biography did not go unnoticed. When it turned out that there had, in fact, been a draft article about her that had been rejected, many saw this as evidence of systemic sexism in Wikipedia. There’s a real gender gap on Wikipedia – fewer than 18% of biographies are about women. The way that Wikipedia is written (by a community of volunteers which skews very heavily male) compounds the systemic challenges that women scientists face in advancing their careers. Wikipedia’s notability and sourcing guidelines provide further hurdles, because they rely on coverage in secondary sources, but women are covered less in the media, and journalists approach them less often when interviewing sources. And when it comes to public perceptions of whether someone is important, not having a Wikipedia biography weighs into whether people think you’re important. The Wikipedia community has long recognized that the established rules around notability work poorly for academics; academics are judged on the value their peers put on their scholarly output, not on the extent to which they are covered in the media. Specific notability guidelines for academics try to evaluate people on their contributions to their field of study, but these run into problems as Wikipedians try to find objective ways to decide what “significant impact in their scholarly discipline” actually means in practice. While women scientists face a variety of barriers to inclusion on Wikipedia, the biggest barrier remains the simplest one: if no one takes the time to create your Wikipedia biography, it won’t exist. Since 2007, across the fields of Physics, Chemistry, and Physiology and Medicine, 91 scientists have received Nobel Prizes. Twelve of them, including Donna Strickland, didn’t have a Wikipedia biography until after their Nobel Prize was announced. While Wikipedians generally write about whatever catches their fancy, when you assign your students to work on a topic as part of a Wikipedia assignment, you get to tell them what to write about. For many of the instructors we’ve supported, that topic is women in science. You may not be able to undo the deficit of coverage, but your students can make a difference – and maybe, like Erik Herzog’s student in 2013, they’ll create an article about a future Nobel Laureate. To start teaching with Wikipedia, visit teach.wikiedu.org for all you need to begin. Or reach out to contact@wikiedu.org with questions. To learn how to create and expand Wikipedia articles yourself, take one of our virtual courses for scientists. Find out more at learn.wikiedu.org. Thumbnail image: File:Donna Strickland.jpg, Abdullah.rahnama, CC BY-SA 4.0, via Wikimedia Commons.